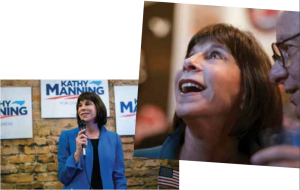 Kathy Manning, a former immigration lawyer, is in many ways an ideal candidate. In her home base, Greensboro, N.C., she has held been known for her work spurring job creation and retraining, and for her multiple volunteer roles—leading United Way, sitting on cultural and business boards, and more. She was the first woman chair of the Jewish Federations of North America, serving 2009-2012, a perch giving her huge visibility and contacts with leaders in philanthropy and Jewish communities across the United States and around the world. Many of these people have stepped up as Manning’s cheerleaders and supporters. With her strong identification as a Jew, and her visibility locally, it’s not surprising that some anti-Semitic comments have been unleashed. One respondent on the website of her Republican opponent for the Congressional seat called her “Kathy Chief of the Jews.” And the post stayed up for 14 hours, according to local press. The district, once a reliable Democratic stronghold, now, after redistricting, “trends Republican,” said JTA. Endorsed and supported by EMILY’s List, Manning’s platform also includes environmental protections and economic stimuli, a powerful motivator for voters. And access to affordable health case is a personal issue for Manning, 61, who has a child with a chronic illness. On the EMILY’s List website, Manning talks, as she often does, about fighting insurance companies and knowing firsthand of the rising costs for life-saving drugs. Plus, she said, she worries that her daughter’s pre-existing condition could keep her from getting the coverage she needs to access care in the future. Manning won her primary, and will be the Democratic candidate on the ticket in November. She told voters that she understands from her own family’s experience how alarming is the crisis in affordable health care.